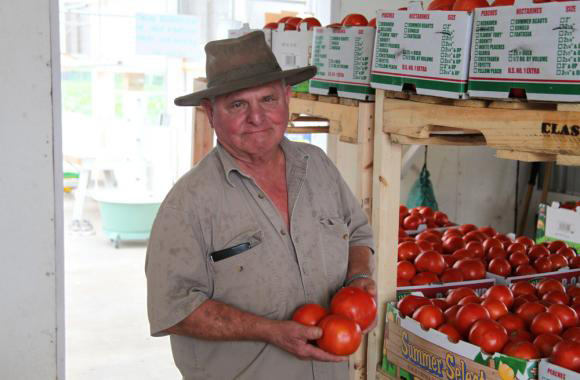 What is the 2016 Rodeo Tomato? 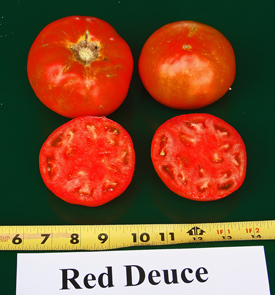 ‘Red Deuce’ tomato is a determinate plant which produces big yields of large to extra-large 10 oz. globe shaped fruit that have great eye-appeal and good eating quality. 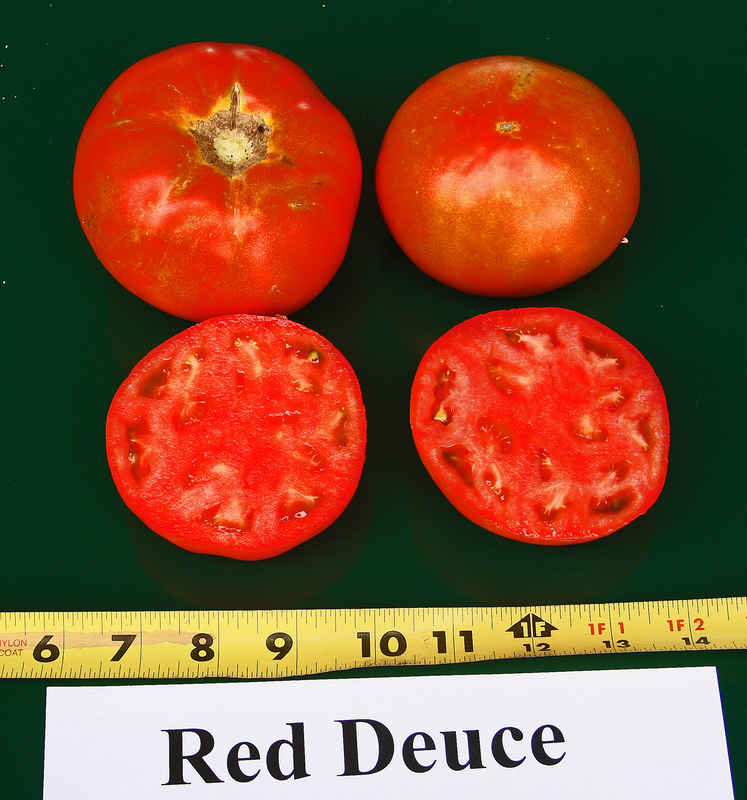 ‘Red Deuce’ has resistance to Verticillium Wilt, Fusarium Wilt (races 1, 2), Tobacco Mosaic Virus and Stemphylium. S - Grey leaf spot caused by Stemphylium spp. In most cases these “early bird” winners are “potting-up” their plants in 1-gallon containers prior to setting them out in the garden for spring, when the soil and air temperatures have warmed up enough to support tomato plant growth and fruit setting (early March through the first week of April). To “pot up” your transplants, fill a one-to-three gallon black plastic nursery container with a pre-moistened premium potting mix. Enrich the potting mix with copious amounts of a slow release fertilizer made especially for containers, such as an 18-6-12 Osmocote analysis. If an organic fertilizer formulation is preferred, consider a 4-2-3 or similar analysis at twice the rate. If you want maximum fruit production, be generous with the fertilizer; as tomatoes are heavy feeders. Since these varieties are short statured in growth, good fertility will be required to produce optimum yields of 20 pounds plus per plant. The key plant nutrient will be nitrogen. If adequate plant fertility is not maintained, the tomato bush will be small, yellow in color and produce much less fruit. Place the transplants in the container. They can be planted deeply; tomatoes are one of the few plants that can tolerate deep planting. Adventitious roots will form along the whole stem. This is especially important if your transplants are leggy or top heavy. Start with healthy, dark green, well established transplants. They should acclimatize to the wind and sun. It is important to keep the tomatoes adequately watered BUT NOT OVER-WATERED. That is why; we start out with a Premium potting mix. Watering frequency will depend on the water-holding capacity of the potting mix used and the plant size. Check the mix moisture by digging around in the pot—if you feel moisture—DO NOT WATER. Too much watering of young plants can cause roots to rot and you will have to get replacement plants. Also, you should apply a dilute water soluble fertilizer, such as HastaGro, at least once a week when watering. The high quality potting mixes are very well drained so they usually will not become soggy. Reduce watering when the weather is overcast and/or cool. If the plant is subjected to more than a few hours of sub 40° F temperature it will stop growing. You will recognize this when the plant stops growing and you see purplish coloring on the leaves. This condition often happens if you plant the tomatoes directly into the garden before March 15th and are not covered with a plant cover like N-Sulate till about mid-April. To maintain the tomato transplant in a growing state, move it to shelter when temperatures below 40° F are forecast. That may mean, moving the containers into the house on cold evenings. If you do everything as described above, your “potted up" plants will become quite large, and may even begin blooming by late March or early April. The plants can then be transplanted to the vegetable garden or a much larger 20” diameter container. Do not let plants be transplanted with small fruit before moving to a permanent location. If fruit are allowed on transplants, the plants will be stunted when establishing them in the garden location. So, remove those fruits for ample plant establishment! Do not apply organic mulch around tomato plants until early May, when soil temperatures have warmed. Then mulch with an organic double shredded hardwood or native cedar type mulch. If the plant is grown in a container, be sure to water and continue feeding every week with a water soluble fertilizer as recommended on the label. David Rodriguez is the Bexar County Extension Agent-Horticulture. For more information or questions call the Master Gardener 'Hotline' at (210) 631-0400 or email your questions to: info@bexarmg.org.